John H. Mann & Co., Syracuse. "John H. Mann, the founder of this well-known house, was born in Peterborough, England, in 1825, and came to America in 1849, settling in Syracuse, where he remained until his death, which occurred on Aug. 3, 1892. On the site which is now occupied by the Onondaga County Savings Bank Mr. Mann started in the grocery business in the year 1852, and successfully laid the foundation for one of the best retail establishments in Central New York. Mr. Mann was an enthusiastic huntsman and fisherman, and attained an almost national reputation in fly casting. He owned the first breech-loading gun in Syracuse, and was a member of the Onondaga County Anglers' and Sportsmen's Association. He was also a very successful tarpon fisherman. In 1852 he married Annie W. Webber, a lady of English birth, who, with four children, viz. : Mrs. Annie M. Hurst, Edward H., Mrs. William Horton, and George H., survive him. In 1876 the business was removed to its present location in the Bastable block, and as it developed, additional space and help became imperative. You can continue to read on in the John Mann Lures page 2, where I will discuss more in depth of his old fishing lures and patents granted. You can take a tour below of some of his trade cards from the 1860's, see a tin the was used to dispense tea in his store. 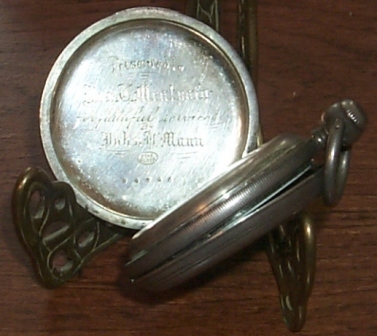 And last but not least my favorite piece in the whole John Mann old fishing lure collection, an engraved pocket watch from John Mann to Joseph Meatyard for faithful services rendered. Who until I found the above bio for the last 10 years has been thought to have been John Mann's lawyer.